Our Vines wall stencil from the Kathy Peterson "Inspired Stencil Collection" will add a nice touch to an accent wall, or even in the entire room. Anybody can achieve fantastic results using stencils without the hassle or cost of wallpaper! This Vines wall stencil comes with a free top stencil for filling in those tricky areas at the ceiling. 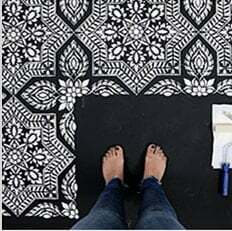 DIY decorators can also use this stencil pattern for rugs or floors, or to create one-of-a-kind designer curtains. This Vines stencil pattern also comes in smaller Craft size, perfect for stenciling pillows, lamp shades, furniture, picture frames and other decorative objects. Cutting Edge Stencils is so thrilled to have teamed up with Kathy Peterson who is a TV celebrity, author, design expert and syndicated columnist. Together we created a very versatile stencil collection which is complete with geometric, organic and classical motifs that work with any decor. Kathy says: "I love being in the garden and for an organic look, I created this Vine stencil to give your space a rich, decadent look of floating vines. Now you can bring the outdoors inside whether you live in a city apartment or country cottage! Use this stencil on a floor cloth, wall or ceiling to create a space that is uniquely you! Stay inspired!" This designer stencil pattern is made out of durable 12 mil clear plastic stencil material. This material is strong but flexible, reusable and easy to clean. We love it so much more than standard 5-8 mil Mylar! It's not brittle, user friendly and just so easy to work with. In our many years of professional stenciling this material has proven to be far superior than any other stencil material we used. Our customers love it too, and we are sure that you'll notice the difference! Our stencils will last a long time and are a pleasure to use.